Every large mechanical system, especially one as big as a house wall, needs to undergo regular maintenance in order to be efficient. This type of routine also helps reduce operational wear and tear, as well as prevent all sorts of accidents. Our garage door maintenance service will do wonders for your system. As some of the hardest working parts of your entire system, the springs deserve some extra care. Our technicians will lubricate their coils to ensure they produce as little noise as possible and be as efficient as they can. We'll also test their tension and make sure that they are well adjusted in order to keep your garage door perfectly balanced and completely even. We'll also make sure the safety sensors your opener relies on are correctly aligned and able to detect obstacles. These photoelectric eyes are incredibly important, as without them your door could accidently close on a person or an object, and damage itself, as well as its obstacle. If the sensors are misaligned, you can count on us to reposition them and make sure that their lenses aren't blocked or dirty. One of the main focus points of our regular maintenance service is a complete system examination. We'll check everything from the panels to the tracks and even the opener's rail and drive system. Any signs of damage will be addressed on the spot. Any steel roller will be lubricated, any misaligned track will be corrected and any dent, bent or crack will be properly straightened and fixed. No matter what type of door you have or how long it's been since you had it serviced by a professional, our team will make sure that it's able to continue functioning for a lot longer. Why wait until things go wrong when you can preemptively take care of dangerous issues by keeping them from even occurring. 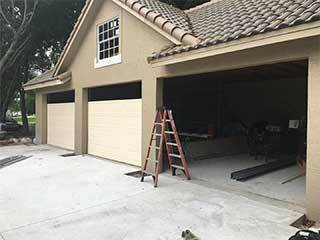 Contact our experts at Garage Door Repair Murrieta to learn what type of benefits our regular maintenance service can offer you.